It is a Sunday night tradition at our house to watch, “Jamie at Home”, on the Food Network. I’ve been a dedicated fan of Jamie Oliver since the days of the “Naked Chef”. He just keeps getting better and his newest show is brilliant. The show focuses on Jamie cooking with ingredients straight from his garden (and sometimes he actually cooks out in the garden). He also shows how easy it is to grow your own food, wherever you live. His recipes are down to earth and delicious. I’ve spent the last year jotting down the recipes as I watched the show on television. I finally went to pick up a copy of his new book, “Jamie at Home”, at Pages on Monday. When I brought the book home, I sat out in my garden with some homemade peach and lime sorbet and carefully flipped through it. The book is beautiful. Lovely graphics and photography fill the 400+ pages. Plus, of course, all the recipes. I’m excited to have all the recipes properly written down in one place, instead of on random bits of paper. I know many of them already. The mothership tomato salad, tomato basil sauce with sausage meatballs and proper chicken Ceasar salad have become standards in my cooking repertoire. I can’t wait to try out more, like the pizza bomba and the beautiful zucchini carbonara. This book will be my inspiration for many future meals. i love jaime. naked chef has always been my favorite. do you watch barefoot contessa and nigella too? melissa – yes, i do watch both barefoot contessa and nigella too, but jamie is my favourite. good point! i have the forever summer book and should look in it for some new ice cream recipes. 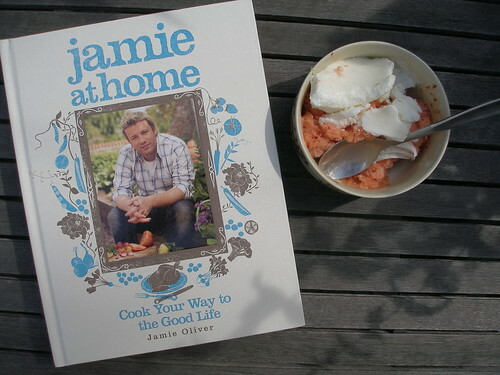 I’m a huge fan of Jamie Oliver and was interested in getting this book! Thanks for the boost of confidence to go pick it up! hi k! p and i made roast potatoes and onions tonight from the book. as p is vegan king, of course we skipped on the pork that goes with the recipe. we had bought 3 pints of new red potatoes this weekend at the north market, then one of our fav vendors gave us a huge bunch of onions, more than we ever would regularly consume. so the jamie recipe was perfect. tart and sweet, especially the onions. yum. hey mb – i just made a recipe from the book last night too! i made the cannelloni with broccoli and cauliflower. delicious.. it’s vegetarian, but not vegan. there’s all kinds of cheese and cream sauce. yeah! for farmer’s market veg!